BioRemove 5805 is a blend of nitrosomonas and nitrobacter that thrive in a wide range of wastewater types and respond quickly during upset conditions to restore nitrification. It is the most effective biological solution for nitrification. 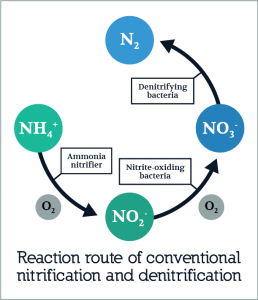 Nitrification is a two-step aerobic process. In the first step, beneficial microorganisms oxidize ammonium (NH4+) to nitrite (NO2-) and nitrite is oxidized to nitrate (N03-) in the second reaction. Nitrification is a sensitive process and is more easily interrupted than other biological wastewater treatment processes. The most frequent sources of nitrification problems include environmental factors, toxicity, solids washout, and loading variation. In some cases, environmental factors must be corrected prior to using BioRemove 5805. After BioRemove 5805 is added to a wastewater system, nitrifying bacteria colonize on floc particles and become part of the biomass. Having a healthy floc-forming microbial community helps maintain nitrifiers in the system and is important for the success of any nitrification program.